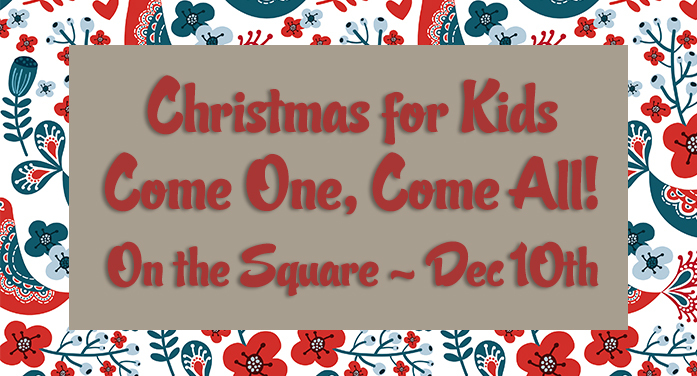 The Edgefield Community Development Association (ECDA) is excited to invite everyone to the square Saturday, December 10, from 11:00 a.m. until 2:00 p.m., to celebrate “Christmas for Kids”! Excitement will fill the square with live, continuous entertainment on the stage. The schedule includes the W.E. Parker Chorus, the Timmerman Dance Group directed by Liz Jordan, the Strom Thurmond Gospel Choir, the Freedom Temple Church of God Choir, and the Edgefield First Baptist Church. Kids will be able to bring their letters and visit with Santa. They’ll enjoy tractor-pulled train rides through town. They can climb on a fire truck and look at the tractor displays. There will be storytelling at the Library from 11:00 – 11:30. Facing painting, nail polishing, and candy cane making will put a smile on their faces! For the parents, a dozen crafters will be around the square to help you with your holiday shopping. Baked goods, chocolate, wood crafts, plants, pecans, home-made crafts, peanuts, and farm produce will be available for purchase. Also, visit our local merchants for all your unique gifts and stocking needs. The House Next Door, The Edgefield General Store, The Edgefield Clay Studio, The Turkey Shoppe on Main, Crouch Hardware, Carolina Moon Distillery, and Finders Keepers have wonderful, unique gifts for those special folks on your list. Need a book for the “reader” on your list – drop into the Welcome Center! Our restaurants and cafes will be offering wonderful menus for this exiting kid’s day! Don’t forget to stop, shop, and stay in Edgefield! Questions may be directed to Town Hall at 803-637-4014 or Theresa McMullin at 803-480-0126.